We recently took a few day trip up to Petoskey, Michigan with my husband, sister, almost 2 year old daughter and I. We had a great time and loved exploring the town. Before coming, I was not sure what to expect as it seemed like it may be a very small town but I was wrong. Petoskey has a ton to do and is a good sized town. We went in July and I loved all that there was to do in the warm weather. I would not recommend going the week that we did which was the week of 4th of July because it was super crowded at times. Some of the people that I talked to said that it was the busiest week of the year. We left early Wednesday morning, picked up my sister and got on the road. About 4 hours later, we arrived at our destination. We started with lunch at Roast and Toast which is a cute coffee shop with an impressive menu. We got the chicken gyros and the Lake Street Salads and added blue cheese. Both were very good but the salad could have been a little bigger. We picked up the Blackwich sandwich for the next day of travel and it was my favorite item. It had cajun chicken, bacon, avocado, lettuce, cheese and bleu cheese pesto mayo on toasted sourdough bread. It was huge and so, so good! Then, we shopped around Petoskey for awhile but Adalyn needed a nap desperately so we went to check into our hotel. If you need any tourist type shirts, check out Momentum where they have the best deals on shirts and more. We picked up some Michigan shirts for less than $7 each! We stayed at the Terrace Inn which was built way back in 1911. It was so cute! I had never stayed in a bed and breakfast style place before and we ended up liking it. The bed was the cutest part! They have a big covered front porch and that evening, hung out there for awhile which was really nice. After Adalyn's nap, we went to dinner at Tap30 which was one of our very favorite meals on the trip!! The best item is their margherita pizza which had a sundried tomato puree, feta and fresh pesto. It was amazing and even my pesto hating husband loved it. You can't go to Tap30 without trying the beer so we ordered some beers. My husband got the sampler which was a great choice because he got to try 4 new-to-him beers which was fun. We found a new craft beer that we loved too Great Lakes Chillwave!! I got the grilled Caesar salad and the gazpacho- both which were excellent. Natalie got the Thai chicken lettuce wraps and Troy got a burger. Everything was great. The atmosphere was cool and trendy. We loved it! Something funny, a girl that we grew up with right on my parent's block was working there- 4 hours from home! What a coincidence. After dinner, we walked down to the playground and beach which was great. There is a nice lighthouse by the marina which was fun to walk to. People were even jumping off the pier into the lake! We walked along the waterfall at Bear River Recreation Area and swore to come back in a couple of days because it was so cool. The next morning, we had breakfast at The Terrace Inn which was included in our stay and the food was fabulous! They had delicious eggs, sausage, bacon, mini waffles, fruit, yogurt, granola, etc. It wasn't your typical complimentary breakfast at all and we were all impressed with the food. We headed off to the UP that morning and then came back the next day. Each morning in Petoskey, my sister and I went on a run/walk around the area which was one of my favorite parts of our trip. We got to explore the area really well and found the cutest waterfall down by the marina that we ended up taking my daughter to. During one of Adalyn's naps, Natalie and I made our way down to the big Kilwin's fudge place which had free chocolate tours and free samples of fudge. The fudge was so fresh and soft. 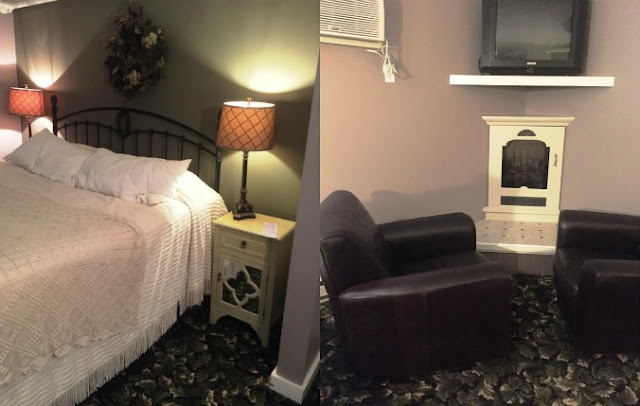 When we got back to Petoskey, we were put in a different room which we loved even more than the previous one at Terrace Inn. There was a big whirlpool tub a big bathroom which Adalyn's pack and play went in, a big king sized bed and we loved the purple grey color on the walls. I would definitely request this room again if we came back- room 215 I believe! We hung out in the hotel room that night and watched the movie Sisters on my computer. The next morning, we enjoyed breakfast at the Terrace Inn again and it was different than before. This time, we had hashbrown casserole with goat cheese and an egg soufflé. The coffee was fresh and hot each morning which we loved having in the little cute cups that the hotel provided. I enjoyed talking to Patty, the inn owner about how her and her husband took over the inn 12 years ago and made many updates to the place. After breakfast, we headed back to the playground and Bear River Recreation Area and walked about a mile each way walking in the river and on the trails. I loved it because it was right in Petoskey near the downtown area. It was a good mix of city and nature trails. Down the path, there was a cute little waterfall which was safe for kids to play in which Adalyn loved. It was like a little piece of the UP in lower Michigan. Then, we went to our last meal there which was our favorite out of all of the meals that we had in Petoskey! We ate outside at The Noggin Room which is inside Stafford's Perry Hotel. We had a few minutes before the restaurant opened for lunch so we checked out the hotel and there was a beautiful, very fancy event going on there. I said that the next time we are in Petoskey, I would like to check out this place more. It would be a wonderful place to have an event. The food was so good! We started with the spinach artichoke dip which my sister orders nearly every time she sees it on the menu. I got the Michigan Fruit, Nuts and Berries salad which was so good with fresh berries and dried cherries. It was served with house made fruit bread. My sister loved the hot buffalo chicken salad. Troy enjoyed the black bean quesadillas. Funny story, the entire trip, Adalyn was asking for tacos. Finally, we found her some fish tacos at The Noggin Room. We had to order them for her! She faceplanted right into the tacos and loved them. How many not even 2 year olds beg for tacos? Haha. On our way home, we stopped in Charlevoix, MI to Castle Farms which is one of the most beautiful places! There were 4 weddings going on there that day and let me tell you, it is the most perfect place for a fairytale wedding. We had to hurry up because we only had an hour until it closed for the weddings. Castle Farms has beautiful gardens, trains for kids, castle buildings and more. I look forward to coming back and checking it out more! We absolutely loved our stay in Petoskey! What I love about Michigan is that each town is so different. It was fun checking out a new town! Disclosure: Thank you to The Terrace Inn, Stafford's, Roast and Toast, Castle Farms and Tap30 for partnering with me. All opinions are my own. I absolutely adore Petoskey! It's such a beautiful area and there is so much to do. Looks like you and the family had a wonderful trip!